The Inclusive Distribution Networks project started from the work of the SCALA Observatory. 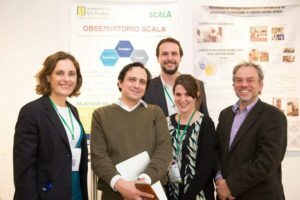 The SCALA Observatory is a project led by the Faculty of Administration of the Universidad de los Andres in which the SEKN network acts as a strategic partner and has multilateral support, that seeks to study and disseminate initiatives which include the vulnerable population in the activities of distribution, sale and maintenance of a good or service. The SCALA Observatory is supported by the Multilateral Investment Fund of the Inter-American Development Bank (BID/FOMIN), Canada’s International Development Research Center (IDRC) and the Citi Foundation. The Observatory seeks to position Inclusive Distribution Networks (IDN) initiatives, a business model that aims to reduce poverty by including vulnerable population in the distribution, sales and maintenance activities of a good or service. The general aim of the SCALA Observatory is to generate and communicate knowledge about the benefits and challenges of IDNs, and to systematize those models with potential to be replicated and scaled in the region and the world. The project was created in response to a call open by IDRC and the BID/FOMIN in July 2015 for the creation of an Observatory of Inclusive Distribution Networks. The proposal was awarded to the University of the Andes in August 2015. Since March 2016, the Observatory is being led by María Helena Jaén. The Observatory has established a strategic alliance with the SEKN Network. Links have also been established with the AACSB, the BOP Global Network, the Business Fights Poverty Network, the CLADEA-BALAS Case Consortium and entities such as the Colombian Agency for Reconciliation, Café Juan Valdez, OIM, PNUD, Unilever and USAID to gather information on relevant experiences.